Dr. Kuhl began his career in palliative carein 1989, providing medical care for people with cancer in his practice. He was invited to develop a palliative care program for St. Paul’s Hospital in Vancouver. His team at St. Paul’s has attended thousands of people at the end of life. What Dying People Want was written based on research funded by the Soros Foundation Project on Death in America. He is a frequent speaker on palliative care all over North America. He lives in Vancouver, B.C., with his family. Facing death results in more fear and anxiety than any other experience known to humankind. Western medicine has accomplished a great deal in addressing physical pain and controlling symptoms for people with a terminal illness, but much slower progress has been made in understanding and alleviating psychological and spiritual distress. 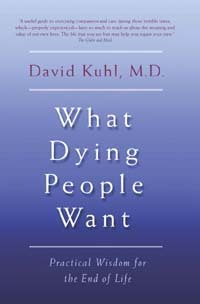 In What Dying People Want, Dr. David Kuhl begins to bridge that gap. He presents ways of addressing the pain, of finding new life in the process of dying and of understanding the inner reality that characterizes the experience of living with a terminal illness. He acknowledges the despair and recognizes the desire for hope and meaning. Dr. Kuhl also presents the provocative idea that insensitive communication by doctors creates more suffering for patients than either the illness or the knowledge of impending death.